JJ Tapestry. Size 22 Tapestry  - $2.76 : Yarn Tree, Your wholesale source for cross stitch supplies. Item 8230. Size 22 John James Tapestry Needles. A blunt tip and large eye distinguish the tapestry needle which is preferred for counted cross stitch and needlepoint. 1½” long. From John James. Twelve cards per box. 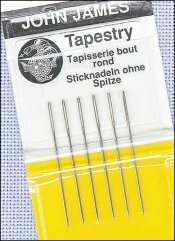 Six needles per card (5 for size 28). Priced per card. Please order by the number of cards.